When Idea Factory International first revealed they would be bringing Death end re;Quest to the West I was pretty excited. This game is another in the Galapagos series of RPGs. These games are geared more towards a Japanese audience. I love Fairy Fencer F which was another one of these titles, so I had high expectations. Let’s see if this very dark title lived up to my hype. A new RPG was being developed called World’s Odyssey. The game was being worked on by a company called Enigma, and when it was just about to release the director, Shina Ninomiya, vanished. The game was never finished. One day the lead programmer, Arata Mizunashi, discovers the game is actually still running. He also encounters the missing director inside the game. Shina’s mind is now trapped in that virtual world. Together, Arata and Shina devise a plan to clear the game so Shina can escape the virtual world and wake up in the real one. This will not be an easy task as the world has been infected with corruption. They will need to work together in both reality and the game world in order for her to be saved. This story is one wild ride, folks. There are more plot twists and turns here than the most badass roller coaster on Earth. The characters here are all pretty well written and you will instantly attach yourself to a few of them. This makes it harder to see them suffer so badly, especially when you choose a bad ending. Lots of different things can trigger these such as going into an area after being warned not to, trying to leave a boss area, or making a bad choice during the visual novel sections. You will need to save as often as possible because you will die and have to re;Quest at some point for sure. I’d love to go into details about how I think Lydia is the best NPC of all time, but it would be spoiler filled and honestly, this game is something you need to experience yourself to fully grasp. There are several different endings you can obtain. I felt like some of the character endings were very lacking, but once you see the true ending, you will be left pondering on how the world around you works for days. 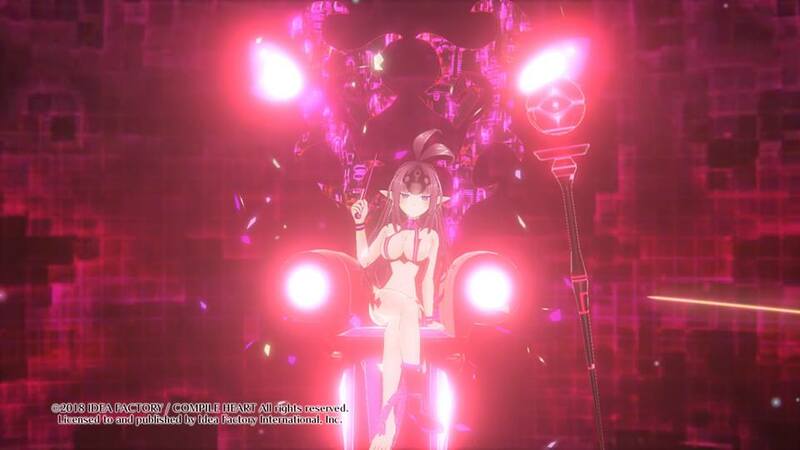 Graphically, Death end re;Quest is one the best looking titles Compile Heart has developed. All of the character models are crisp and clear. The character portraits and CGs are all done very well and look like they were handled by the same artist that worked on Trillion: God of Destruction. The wildly varied environments from the inside of volcano to a lush forest are greatly detailed and really give the world a sense of depth. The enemy models are based mostly on insect-like creatures. This makes sense given this game world is full of bugs. These are all well thought out and highly detailed, especially the Entoma Queens. These boss monsters are very impressive in their scope and detail. Party members lose of a lot of their clothing when they transform in Glitch Mode and I thought the designs were great as well. I know some may find it odd and out of place for them to do this and write it off as fanservice. This game does have a darker, more serious tone; but I saw this as more of the girls losing their inhibitions, so this was just showing off their wild side more. 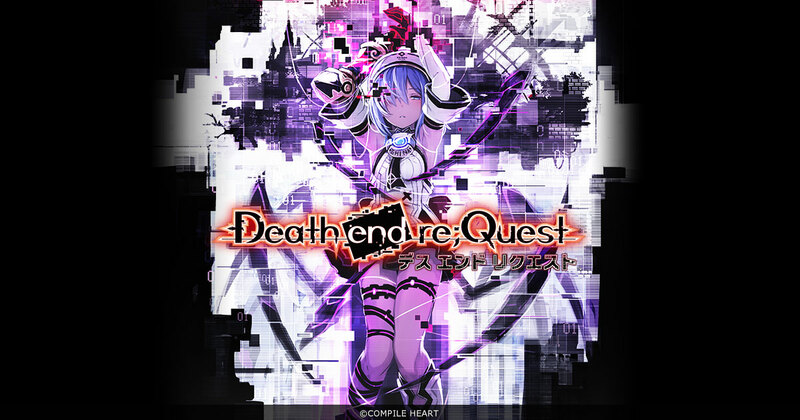 Death end re;Quest has one of the best soundtracks I’ve heard in a Compile Heart game. The tracks vary a great deal since you’re dealing with two different settings, one being in-game and the other in reality, which is more like a visual novel. The in-game stages all have upbeat tunes that encourage exploration. They certainly have that fantasy RPG tone to them. The music that plays while in reality is a bit more somber most of the time, because most of the time, bad things are happening there. All of the tracks compliment the scenes and really help drive home the emotion they are trying to convey. You can play the game with both Japanese and English audio and honestly, I loved both casts, so you can’t go wrong either way here. Gameplay in this one is pretty straightforward. You will explore the World’s Odyssey in order to reach the last boss and clear the game. 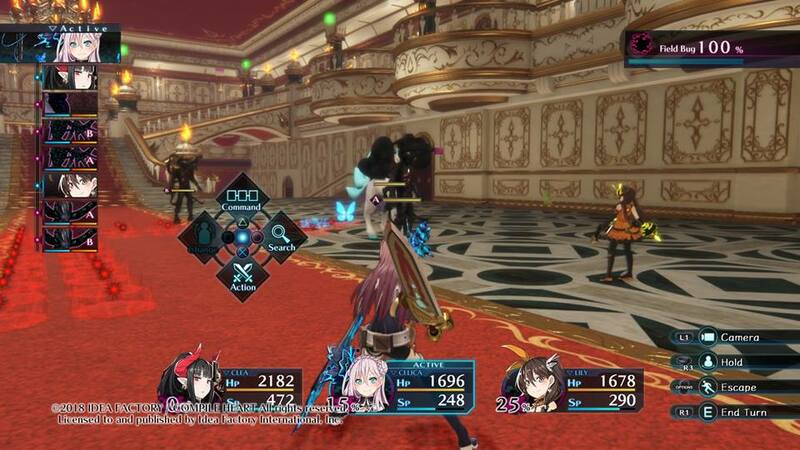 The maps on this game are larger than most other games Idea Factory International brings over. They are also very confusing at times. This is due to them being glitched out by the bugs corrupting the world, so you may have to find keys or items in the world to trigger an event in reality before you can advance onward. I spent more time lost in the castle and forest than I actually knew where I was going, to be honest. It does mark some objectives on the map but not others, so you will be wandering aimlessly at times to find things. This gets annoying when the monsters keep respawning and you just want to find your way and have to deal with beating down the same baddies you have 100 times because you’re lost. The real world section of the game plays out just like a visual novel. There is some quality art and tons of dialogue. Some scenes are fully voiced while others are not. There will be times when you are given choices depending on the situation in the story. These can lead to dead ends and you will get a game over screen. This is why you should save often, even if the game does let you keep you exp and skills you’ve learned, you will still have to redo any story progress. You can switch between the World’s Odyssey game and reality on the fly in the game menu, and I think that’s really what makes this title unique. Instead of things feeling disjointed like most games feel when you switch between two worlds, this is pretty seamless. The last thing I would like to cover in this review is the combat system. 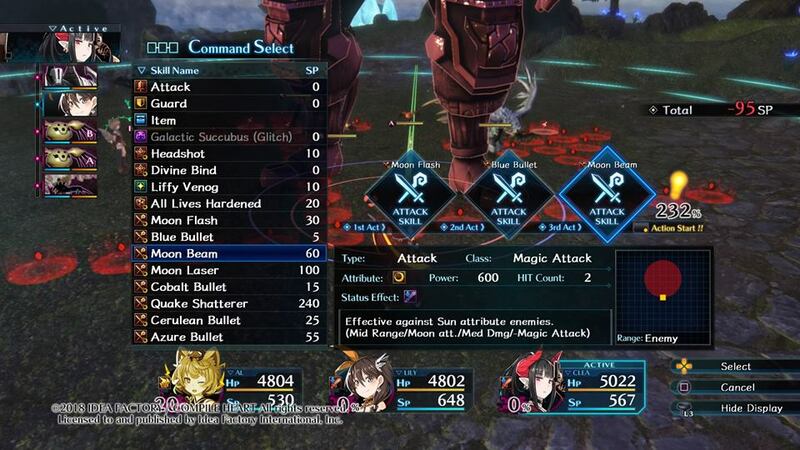 Death end re;Quest has a fantastic combat system. 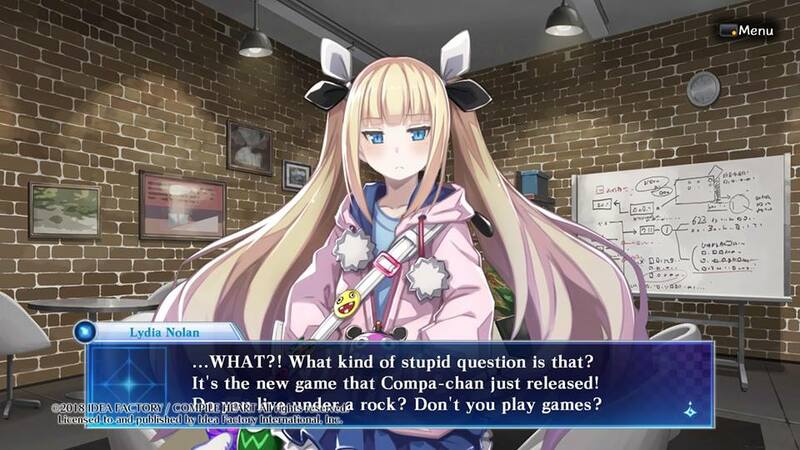 It works a lot like what you expect from a Compile Heart title. It’s turn-based and you move around on the battlefield lining up attacks. 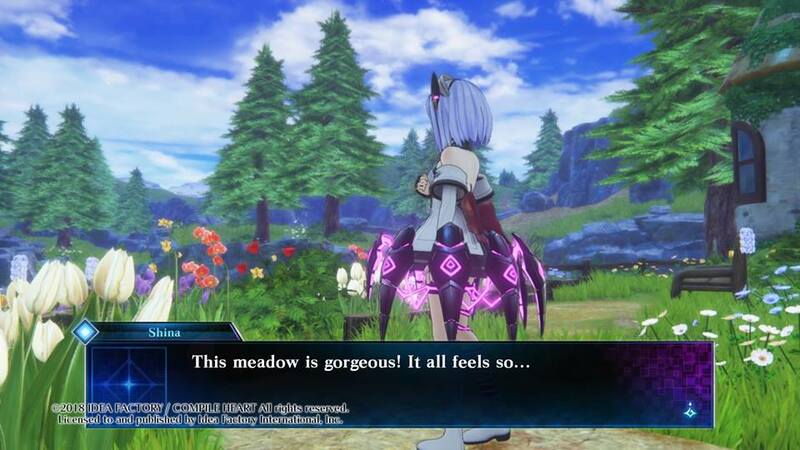 You’ve seen this in the Neptunia series for quite some time now, but here they have added some new things to spice up the mix. First off, you will notice the floor has glowing circles of different colors. These are called field bugs and stepping on them will have various effects on your party. Some will restore MP or make your corruption level go up, while others may damage your HP or have other negative effects. You can use these against your enemies as well. When you complete an attack chain, some attacks will have a knockback effect. This will make the enemy go sliding across the floor and any field bug they go across will trigger effects. If you knock them into one of you party members, they will bat them away causing more damage. Think Mugen Souls without the air combos, basically. Whenever you attack, you will always be able to perform three actions in one turn. 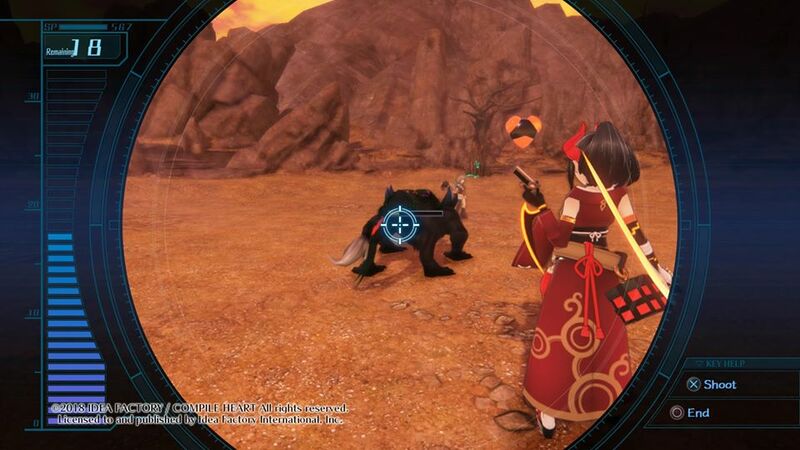 You can do three normal or special attacks, throw in an item or mix it up. You will learn new skills the more you use certain skills you have acquired, and the game will let you know the chance of learning a new skill from these actions if you look on the left side of the screen above the effective range box. When you take damage or walk across the floor bugs, your corruption level will increase. When this reaches at least 80%, the girls will transform into Glitch Mode. All of their stats will be boosted and they will receive one over the top Glitch attack which will do massive damage to everything on the screen. You should be aware though, if your corruption reaches over 100%, it’s an instant KO until someone revives you. When you have lowered the field bugs to less than 50%, Arata has his time to shine. He can hack the game and give you a helping hand in a variety of ways. Code Jack will allow him to change the type of field bugs found on the battlefield or reduce their effectiveness. Install Genre will allow him to flip the game’s genre around which triggers a mini game in which you can deal massive damage to your foes. There is shooting, billiards, fighting and more. This is something I found really unique about this combat system and while simple, it was a lot of fun. Lastly, he can summon any of the boss Entoma Queens you have defeated onto the battlefield. These are not only big beasts but they have a variety of effects they bring into battle as well. One increases knockback distance while another may give you a big health boost while being on the field. These are really useful when trying to figure out how to deal with some of the game’s more tricky battles. 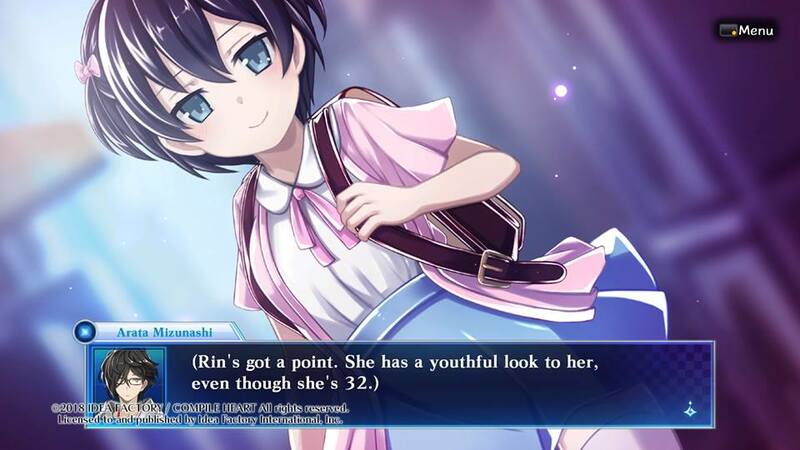 Death end re;Quest does a lot of things right. The story is really well thought out and I really loved all of the characters. I felt the end of the game was a bit rushed, and the character endings themselves were lacking until you got to the true ending. The dual storytelling of the real world and game world at the same time is very unique, and I feel like the game really pulled this off well. The combat is fun, it takes the best parts of combat systems used in other Compile Heart games and spices them up with some new ingredients to make a delicious dish. The map design in this game is just plain confusing. I get that the world is glitched out and corrupted, but maps here are a nightmare in most areas. You will spend a lot of time aimlessly wandering around trying to figure out where to go next, and while I don’t expect a game to spoon feed me, there is a limit to how backasswards you can make a map before I get frustrated. That being said, I still feel what the game does right by far outshines its flaws. If you’re looking for something different that is a bit darker than your average JRPG, I would highly recommend you pick this game up today. You will not regret it, and while I can compare certain aspects of it to other titles, there is really nothing else like this out there today. I spent about 30 hours on one run and quite a bit more to get the other endings via New Game+. This one is well worth the $59.99 price tag, just be prepared for a rough ride and be sure to save often. Death is around every corner and you will be re;Questing a lot!